Get inspired with these ideas submitted from schools that earned the Cook It Up badge! In talking with some of our teachers, and from programs we’ve run in the past, we learned that students enjoy cooking workshops. Our health unit offers a cooking program for Gr. 5 classes which our teacher was interested in, and our Gr. 6/7 teacher was interested in cooking with her class as well. Our Gr. 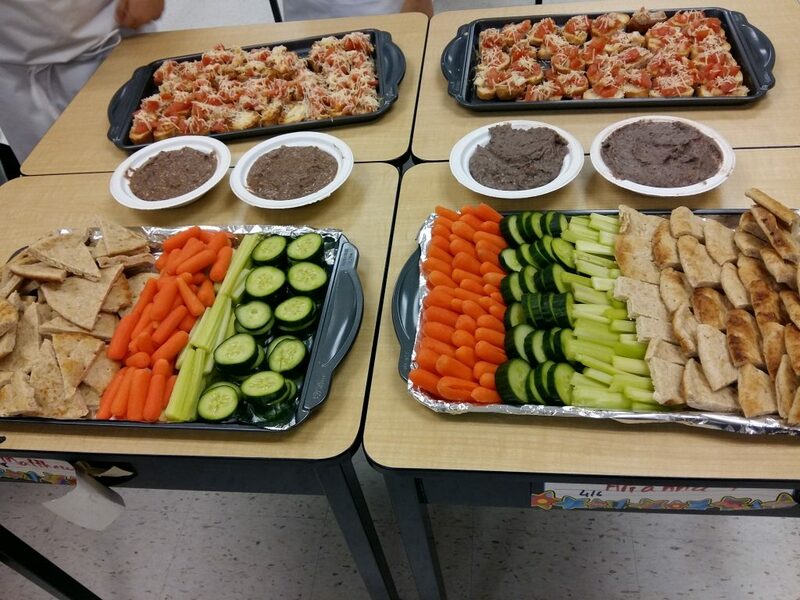 4/5 class participated in the “Cooking with Kids” program offered by the health unit. It was 3 sessions focused on vegetables and fruit and simple cooking methods. The students had lessons on knife safety, cross-contamination, hand washing and cooking techniques. Our Gr. 6/7 class planned and participated in their own cooking session where they learned some kitchen safety and cooking skills, as well as practiced some math through food and recipe costing. Aside from the fun that was had in our more formal cooking classes, we also had our health unit partners come in and prepare some snacks with our after school program students to be served at our Earth Night. The snacks highlighted the foods available in that month’s Good Food Box, so all contained veggies and fruit. The students all learned something new through each experience. The favourite part was probably eating the food the students prepared for themselves. We implemented a program called the Junior Chef Ambassador program. We explained the program to grade 7 students and asked which students would be interested in being trained on how to cook healthy foods and learn skills for the safe handling of foods and utensils. We selected 20 gr. 7 students who would benefit most from the program and develop leadership skills as well as be positively influenced by this program. These Chef Ambassadors were trained by a public health adult who trains the teachers for the You’re the Chef program. Following the training these students will offer a workshop to younger students and teach them how to cook healthy meals. Our favourite part about this is training students how to cook healthy meals and seeing them enthusiastic about this and also allowing students to be in a leadership position to then train younger students. Some of our Grade 6’s signed up to take part in the “You’re the Chef” program. For three consecutive weeks, parent volunteers led four groups of students on a cooking adventure!! We made oatmeal, homemade granola, bruschetta, black bean dip, fajitas and pasta. The students learned how to wash and cut vegetables, how to measure ingredients and how to follow a recipe. The favourite part of this program was watching the students eat and enjoy what they prepared.